YOUR HOME NEVER HAD IT SO GOOD. Packed with features and ways to save, the EcoNet Smart Thermostat offers so much in such a small package. See for yourself. In many homes, adjusting the thermostat to make one area more comfortable can result in other areas becoming less comfortable. But once you have the EcoNet Smart Thermostat, you can add EcoNet Zoning System controls and dampers to enjoy customized comfort throughout your home. Perfect for homes with two or more floors, hot or cold spots and/or unoccupied rooms. The EcoNet Zoning system enables you to create ideal comfort where you want it, when you want it. 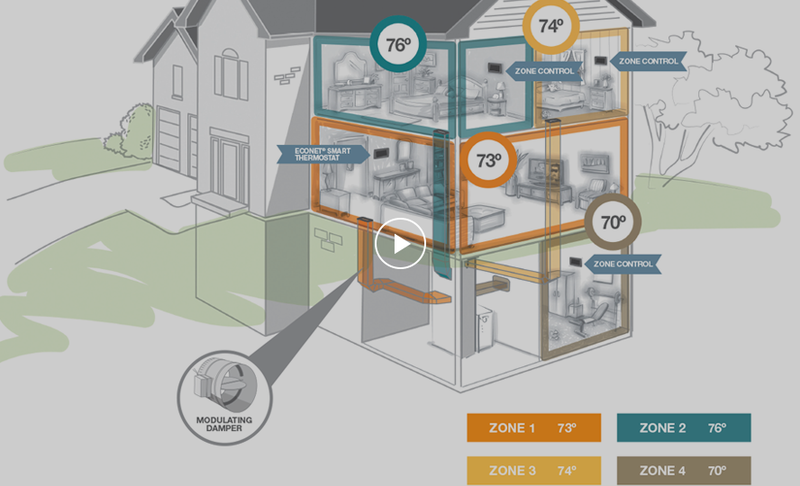 Why would a zoning system be an optimal home comfort solution? In many homes, adjusting the thermostat to make one area more comfortable can result in other areas becoming less comfortable due to differences in sun exposure, ventilation and other factors affecting the different parts of a home. Perhaps you’re caught up in family “thermostat wars” or you have areas that are often unused. The EcoNet Zoning System allows you to divide your home into separate areas, giving you, and all the members of your household, ultimate control of their individual comfort preferences. How to know if zoning is right for your home? Do some areas of your home get hotter or colder than others? Does your home have multiple stories? Does your home have vaulted ceilings or a loft? Do you have any rooms with floor-to-ceiling windows? Do some parts of your home get used infrequently? Does a portion of or all of your home lay over a basement? Do certain members of your family have different temperature needs than others? 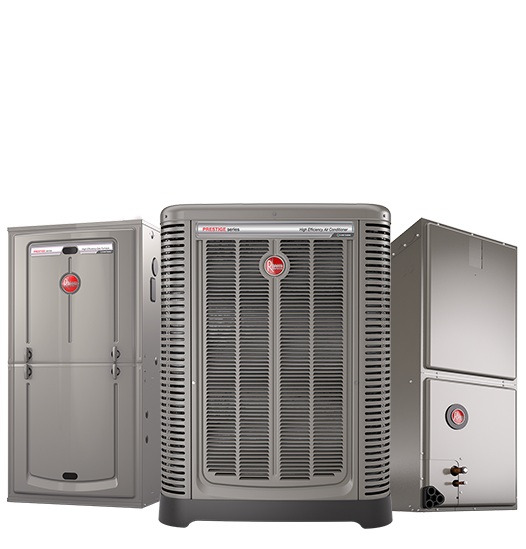 IMPORTANT: An EcoNet Zoning System requires a Rheem EcoNet Enabled HVAC system. 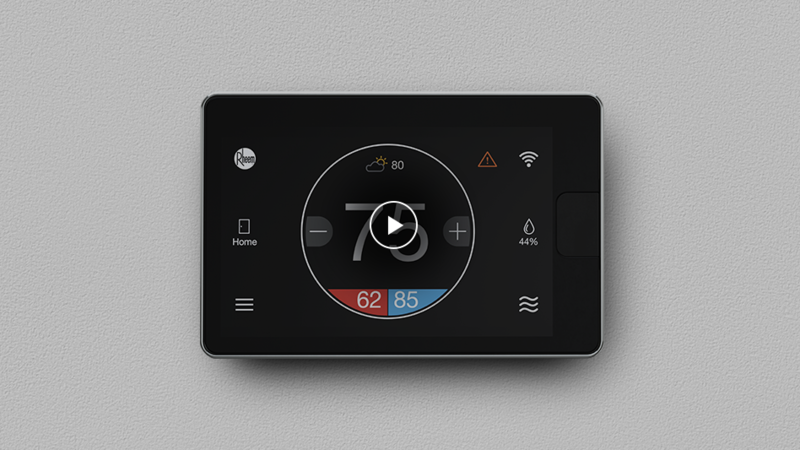 EcoNet Smart Thermostat: Must be used as the primary thermostat for the home to control the first zone. The operating mode (heating, cooling, etc.) selected by this thermostat will determine the mode for the entire home. It can also be used to monitor current status of each zone and customize settings for the entire zoning system. EcoNet Zone Control: Installed in each of the zones (excluding the first zone) of the home in order to monitor the temperature and humidity in those areas and to provide users with an interface for adjusting the desired temperatures and schedules for those areas. EcoNet Zone Control Panel: Housed by the indoor HVAC unit and accessed by your contractor, it allows the EcoNet Smart Thermostat to communicate with the zone dampers in the ductwork to regulate the air delivered to each zone. Zone Dampers: Installed in the ductwork to regulate and control airflow to the different zones. Depending on what zones require conditioning, the dampers automatically close and open. How does it affect my home’s cooling and heating system’s operation? The operating mode (Heating, Cooling, Auto, Fan Only) of your system is controlled by the EcoNet Smart Thermostat. However, the EcoNet Zoning System allows you to control temperatures in each zone independently from one another. If your system is set to the Heating or Cooling operating mode, all zones will operate in heating or cooling and follow the respective set point for each zone. Some homes may have significant simultaneous heating and cooling demands in different zones. To address this need, the system should be set to operate in Auto mode. When the system is running in Auto mode, the equipment will alternate between heating and cooling, depending on demand. This may result in higher energy usage, but will provide the benefit of greater comfort overall. How does it determine which zone to satisfy first? If the HVAC system is in Auto mode the zone that calls first will determine the HVAC equipment operation. Once the zone is satisfied the system will switch modes of operation to satisfy a zone with an opposite demand if necessary. Can I control my EcoNet Zoning System remotely? Yes, you can control the temperature in each zone as well as other settings, using the EcoNet app. How is airflow directed to each zone? Motorized dampers work inside your ductwork by opening and closing in partial increments so you can fine-tune the air going into each zone for maximum comfort. How can I control humidity? The more humid the air in your home, the more heat it can hold. By controlling your indoor humidity, you will have more control over the heating and cooling of your home, and the ability to make these processes more efficient. In addition, managing the humidity inside your home means healthier air; we recommend keeping indoor humidity levels between 40-60%. The EcoNet Zoning system gives the option of monitoring humidity several different ways. Each zone control has a built-in humidity sensor and will display the indoor relative humidity for the given area of the home. 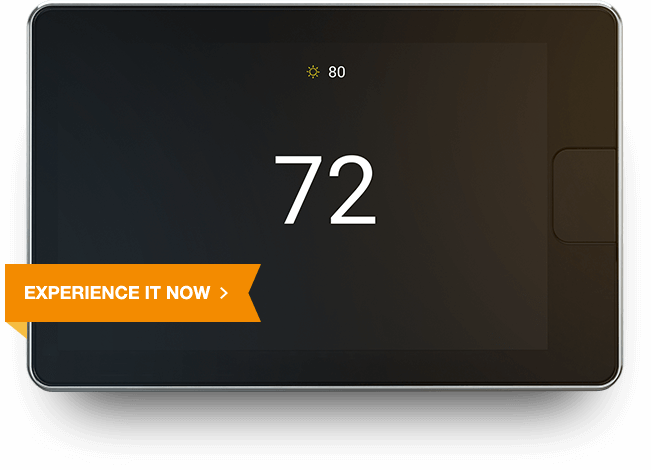 From the EcoNet Smart Thermostat you can elect to average the humidity from all zones or select a specific zone to read the humidity level in the home. The selected humidity reading will be used as the benchmark if the Over-Cooling dehumidification feature has been enabled (pg. 14 of the EcoNet Smart Thermostat User Guide). When over-cooling is enabled the system will continue cooling below the set point in each zone if the humidity level is above the humidity set point. What is the Continuous Fan Setting? The Continuous Fan setting will run the indoor blower to circulate conditioned air between calls for heating or cooling. When used appropriately Continuous Fan can help improve indoor air quality and keep the space from feeling stuffy. The EcoNet zoning system is able to run independent Continuous Fan speeds (Low | Med. Lo | Medium | Med. Hi | High) in each zone. Each zone can independently follow a programmed schedule. The schedule for each zone must be set from the EcoNet Zone Control or the EcoNet app. When following a schedule, manual adjustments will temporarily override the programmed schedule. The schedule override time is configured by accessing Menu > Settings > Schedule Override. For assistance setting a schedule, please refer to the EcoNet Smart Thermostat User Guide. How does One-Touch Away work? One-Touch Away allows you to quickly override the programmed schedule and switch to your energy–saving away preferences when you leave the house. The One-Touch Away feature is available from the EcoNet Smart Thermostat or EcoNet app, and when enabled applies to all zones. However, the EcoNet zoning system allows you to customize the away settings for each zone. If you are going to be away from the home for an extended period, a Vacation can be scheduled from the EcoNet Smart Thermostat or the EcoNet app. You can set unique heating, cooling and fan speed settings for each zone to follow during a scheduled Vacation event. Can Airflow Noise Limits be set for each zone? Yes, if the airflow noise in a particular zone seems too loud, an airflow noise limit can be set to curb the amount of air delivered into the zone reducing noise caused by high airflow. The chosen limit may affect the system’s ability to maintain desired temperature in the zone. We recommend using the default setting of “unlimited”. IMPORTANT: When demand exists for only one zone, its airflow noise limit must be more than the minimum airflow required by the equipment, or the equipment will not operate. In large open zones, air is constantly moving from warmer zones to cooler zones. This may make it difficult for a zone to meet demand if there is a large set point difference between zones. Over Conditioning allows zones to be over conditioned, or temporarily drop below the desired set point, in order to satisfy the demand of another zone. The default is set to 0°F and can be adjusted up to 5°F. Setting Over Conditioning to 2°F means zones may drop up to 2°F below the set point in order to allow another calling zone to reach set point. Can each zone be named? Yes. The name of each zone can be customized for your home using the EcoNet Smart Thermostat or EcoNet app. Ready to take total control over your comfort? 1The EcoNet Smart Thermostat works with water heating equipment only if a compatible heating & cooling unit is installed in the system. 2WiFi broadband internet connection required. Download the Rheem EcoNet App from the App Store or Google Play to set up your EcoNet Smart Thermostat. Receipt of notifications depend on home WiFi set up. 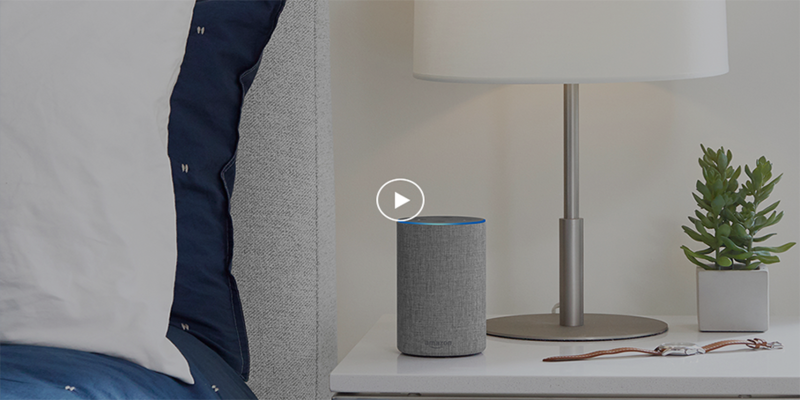 3When used with Amazon Echo or Dot. 4WiFi broadband internet connection required. 5Room sensors sold separately; Each EcoNet Smart Thermostat can connect to one remote temperature sensor. 6Models not EcoNet Enabled: RA1724AJ2NB, RA1736AJ2NB, RA1748AJ2NB, RA1760AJ2NB. 7Not compatible with EcoNet zoning.